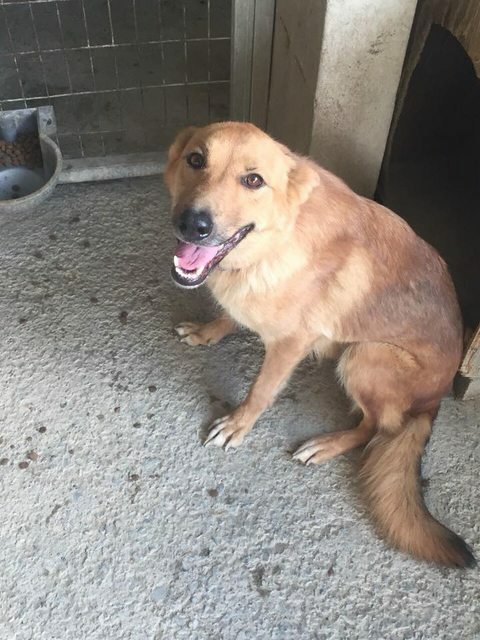 Annie is a 2 year old female Cross-Breed. Annie is a rescue from Cyprus who watched from her cage, time after time, as her friends flew to loving homes. Annie was unlucky, no one stepped forward for her, no one offered her a home. So we have flown her to an amazing foster home in Taunton as we are sure that the first people to come meet her will want her for their very own. Annie is a lovely and friendly girl. She adores humans and truly appreciates any time she can spend in their company. She loves cuddles and curling up with her foster mum on the sofa. Whilst we do not know what breeds may be in her mix, we believe she may have a bit of GSD and she is a very smart and clever girl. She is already walking well on her lead and enjoys her walks. She loves being in the car and travels very well and was really good at the vets when she went for a check up. She is very clean in the house and is learning to ask to go out. She shows no sign of separation anxiety and is quiet and not destructive when left for a couple of hours. She also sleeps happily through the night in her crate. 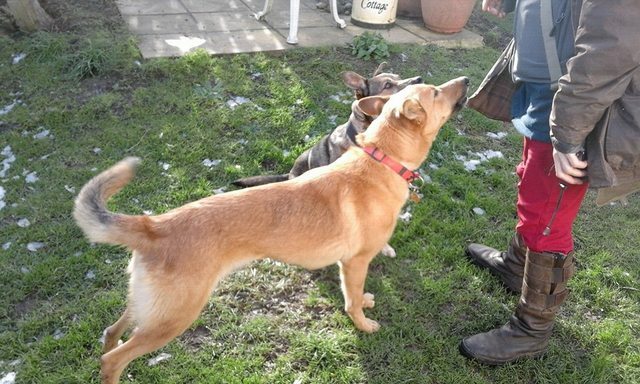 Annie is living with a female Staffordshire Bull Terrier cross German Shepherd Dog at the moment and gets on very well with her. She has met a couple of dogs whilst out on walks and has said hello to them in a polite manner. She also was very good with the other dogs in the kennels when she was in Cyprus. Annie is not so good with small dogs or cats and would prefer not to share her home with any small furry animals as she can get a little obsessed with them. 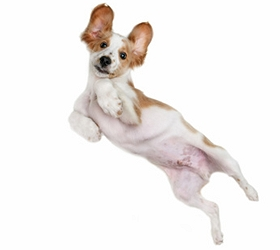 Like any other dog joining your family she will benefit from ongoing basic training. She is a quick learner and already sits nicely for her food and to have her lead put on. 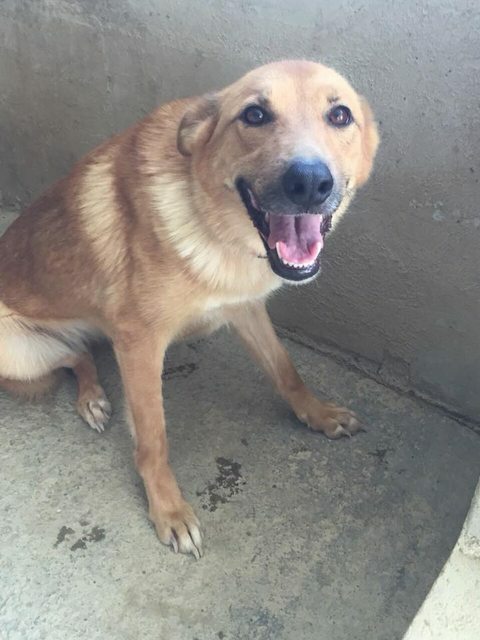 Since arriving in the UK, Annie has not had the chance to be introduced to any children yet but she was very gentle and friendly with the children who visited her when she was in the kennels in Cyprus. 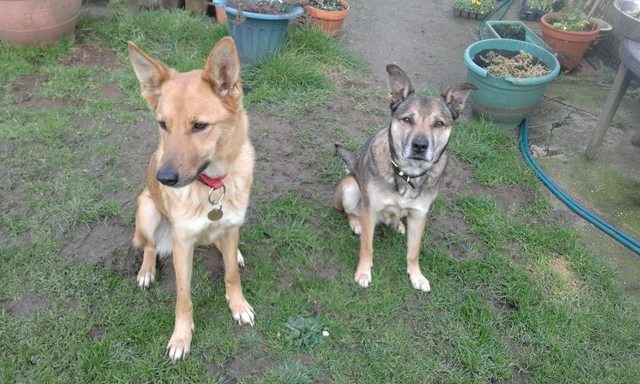 We have no doubt that Annie’s new family will fall in love with her when they meet her. All she asks is a family to adore her, a garden where she can play and relax safely and a human or humans who will want to share walks and adventures with her. She is now living a life that is good and ready to join her ‘furrever’ family. If you would like to meet this happy, gorgeous girl to see for yourself how amazing she is, please contact us. She has been neutered, vaccinated and microchipped. Minimum adoption donation of £275 applies. ADOPTIONS SUBJECT TO HOME CHECK. Post adoption support is available from our charity.